This is not your typical chocolate chip cookie recipe! This recipe is gluten free, paleo and uses substitutes for butter and sugar. Coconut flour is used in place of regular flour which is awesome because coconut flour is high in fiber and has a low glycemic index (meaning it won’t make your blood sugar spike- as muchI). Peanut butter and coconut oil, which also have low glycemic indices, replace the butter (and offer more healthy properties too). Lastly, honey (moderate glycemic index but lower than white and brown sugar) is used in place of white granulated sugar. Of course, as always, moderation is the key to including any of these tasty treats, but enjoy! 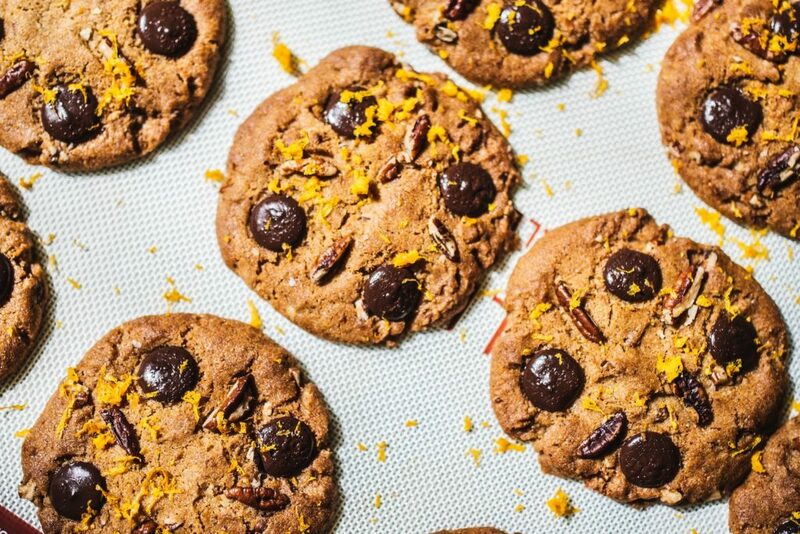 Preheat oven to 325* F. Prepare cookie trays either with parchment paper or mist you’re your favorite cooking oil. Combine dry ingredients (flour, baking soda, and salt) in a small bowl. In a separate bowl, whisk together peanut butter and coconut oil (coconut oil should be soft but not liquid). Whisk honey into peanut butter mixture until all ingredients are combined. Add the egg into the peanut butter and honey. Whisk together. Add vanilla extract to the mixture and whisk to combine. Gradually stir flour mixture into the wet mixture, about 1/3 of the dries at a time until everything is well combined. Allow the cookie dough to rest in the refrigerator for 30 to 40 minutes. Once ready to tray the dough, use a spoon to drop pieces of the cookie dough on to the tray. Space cookies about 2 inches apart (they do not spread too much). Bake for 8 minutes. Rotate. Bake another 8 minutes. Let cool then transfer to serving platter or eat immediately (that’s what I did)! For more healthy desserts, click here! Meghan Skeehan is a Contributing Writer & Nutrition Intern here at ISN. Meghan is an aspiring Registered Dietitian. She is a graduate student studying for her MPH-Nutrition through the University of Massachusetts, Amherst. She is also a dietetic intern with Virginia State University’s DI program. Meghan enjoys many aspects of the health and fitness field. For fun, she likes to go rock climbing and hiking (really, she just enjoys being outside), watch movies, and bake. We’re so lucky to have her on our team!